Audrey Chowdhury will be your guide and facilitator. Audrey is a graduate of the Spiritual Deepening for Global Transformation at the Christine Center. 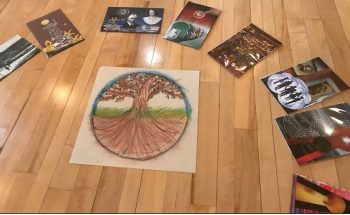 She has trained SoulCollage® facilitators throughout the Midwest, California, and Canada. Audrey is an ordained minister of walking prayer through the Center for Sacred Studies where she studied and travelled with the International Council of the Thirteen Indigenous Grandmothers. She is an experienced facilitator and a frequent participant and presenter at Christine Center programs. Audrey is the author of the book Ancestral Impressions, Exploring Your Ancestry through Creativity, Imagery, and Intuition. (Available on amazon.com ) Her website is audreyfchowdhury.com. Register here.